Structural Cycling is a term I recently thought of to characterise the type of cycling I do mostly. It signifies cycling as a structural part of one's life. It is not essential for survival as are eating and drinking but has status equal to, say, tooth cleaning, nail cutting, shaving, hair washing, tidying the house, etc – not essential but important to a sense of wellbeing and done as a matter of routine. The good thing is that cycling is more fun than the others and something you also do for its own sake. Like many schoolboys of my day I rode a bike to school, at least up to the age of about thirteen. Schools used to have bike sheds. My school's was actually more than a shed, running along inside what was known as the lower cloisters, with enough space for a couple of hundred bicycles (those were the days). When the Beatles came out I stopped cycling, and started again some twenty years later in the 1980s. I sold my school days bike to a friend called Midge Magee, or maybe swapped it for something – I wanted it back soon after, but he refused. Anyway, during the 70s and early 80s I kept myself fit by running. For some reason I reckoned around where I live was too hilly for riding a bike, which is strange because now I seek out the hills. On the spur of the moment I went out and bought a bike for Sandra: a Peugeot Scorpion ATB (all-terrain bike). Mountain bikes had just appeared in the UK and this was halfway between a road bike and an MTB. I borrowed it that same evening and the next day went back to the shop and bought another for me: a Peugeot Black Mamba ATB with a slightly higher spec. It is true how hilly it is around here but these bikes had mountain gearing and from then on I began to cycle regularly, from the mid-80s onwards. I still do, but when I first got the Peugeot I had a day job and now I don't. Until 2008-ish I never thought of myself as a 'cyclist' – I just rode my bike. 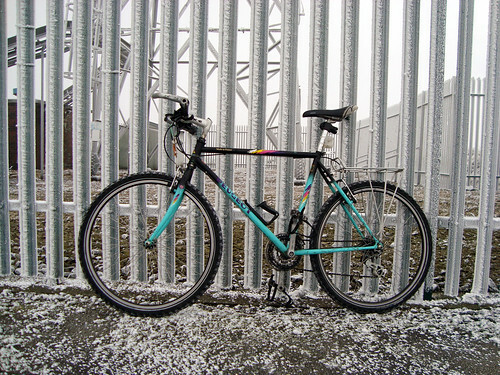 In summer I cycled before work, usually up to the top of Winter Hill. This is not far from my house but rises about 850 feet. I cycled up and back again, then went to work in my car. I'm surprised I managed this because I'm a terrible riser in the mornings, but I did, and sometimes again in the evening, a round trip lasting almost exactly 35 minutes (30 up and 5 down). Or maybe ride up the the evening only. The point was: the daily ride. A day with no ride is not the same as a day with a ride. For winter evenings I had a figure-of-eight route that climbed the same height (850 feet) but didn't mean going to the top of Winter Hill in darkness and winter weather. 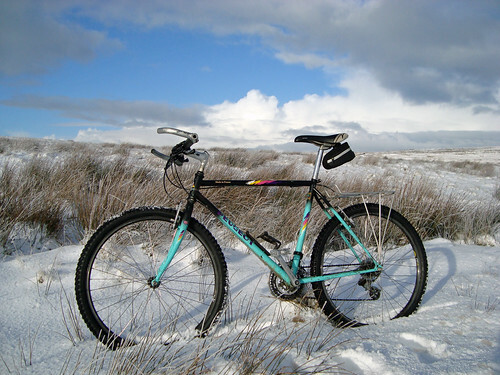 At weekends, Sat Sun year round, my route was about 20 miles, mostly off-road on moorland tracks. I knew nothing about bikes, nor wanted to. The 'maintenance' I did was, at most, a quick wash down and spray WD40 on the chain to stop it rusting. For anything else, including punctures, I took the bike to my LBS about a ten minute walk from home (if I punctured I just walked). That is a factor, I think, because for daily cycling not to be an intrusion into the rest of one's life it must be easy, quick, simple, and with the minimum preparation and put-away time. Chuck the bike in the garage, quick shower, done (nowadays, with more time to spare, I also take pleasure in the machine itself). Occasionally I went on longer rides away from home: Welsh forests or the Peak District with Mike, my cousin, but mostly I cycled my regular local loops in almost exactly the same way I do now, day in, day out. And for all those years until I got a road bike in 2008 I took no interest in actual bicycles or the wider world of cycling as such (except for Le Tour). Structural cycling does seem to capture my type of bike riding. No day is complete without a spin. It is worth mentioning that my father, throughout his late 70s and all his 80s, cycled 11.5 miles/day exactly, often in several stints but always the same daily total. I try to average 20 miles per day but do not always succeed if the weather is especially bad – as it has been recently. Walking is no substitute but sometimes it has to do. Having said all this after almost thirty years of structural cycling I really enjoy special days out in, for example, the Yorkshire Wolds with Chris Bailey, and the longer distances – the occasional 100 miles with friends, and of course cycle touring holidays with Sandra – but unless someone rattles my cage I tend to be lazy and stick to my routine. As my teachers used to say: "He must try harder." I almost abandoned my Peugeot bike but then decided to restore it, including a repaint. The repaint is a slight change of plan but I haven't yet chosen a colour – maybe yellow, maybe dark grey. Sandra's Scorpion is in the back of the garage where I suppose it will stay for a very long time. Posted by Patrick on December 18th, 2012. 'Structural cycling' is a good term for something that is an integral part of life. I usually have one day a week when I don't cycle which allows for days out with Dennis, avoiding lousy weather or just having a bit of a rest but I'm not happy if I have to miss more than that. I've lost 3 days so far this week due to pre Xmas commitments and heavy rain 🙁 I'm plotting a longer ride tomorrow to compensate! We had bike sheds at school but no one used them and my dad wouldn't let me cycle to school. It was 6 miles and I knew I could get there quicker by bike than bus but my parents' thought I would arrive too tired to concentrate on my lessons! Of course the opposite would have been true, I would have been much more alert than I was after sitting in a stuffy bus for half an hour. Matt Seaton, in his book 'Two Wheels' says 'A day without cycling is a day wasted' – I couldn't have put it better myself! In comparing cycling with tooth cleaning perhaps I should have stressed a bit more how cycling is much more fulfilling! I have also lost structure recently – to the weather (will it ever stop raining?) – and also to DIY. On the bright side, at least the 'jobs' have coincided with dark nights and the crap coming down from the skies. Seriously, is this what climate change means for the UK? I got soaked this morning, cycling just two miles to town and back. I'm getting worried about it all, wondering if it's permanent and whether we should start planning to move somewhere permanently south of the Jet Stream. Mind you, it's also been wet in France. I'm embarrassed to mention how many days I've wasted in the past few months, although I did give Titanium Man a shakedown a week ago. I don't cycle every day unless touring but I cycle three days a week or four if the weather is good. I don't enjoy it every day, probably because it would be too many miles, as I tend to cycle about 110-120 miles in total every week all year round, with more in the summer. I walk on the inbetween days, something between 5 and 8 miles, usually. I too, like Patrick, will repeat routes that I like ad nauseam. I've cycletoured in Brittany ten times or so, from Roscoff. I haven't got fed up of it yet!